Legendary cult hip-hop group Artifacts are coming to Laundry! The trio of El Da Sensei, Tame One and DJ Kaos, the New Jersey group released one of the all time great graffiti songs in 1994′s ‘Wrong Side of Da Tracks’, but split soon after the release of their second album, That’s Them in 1997. 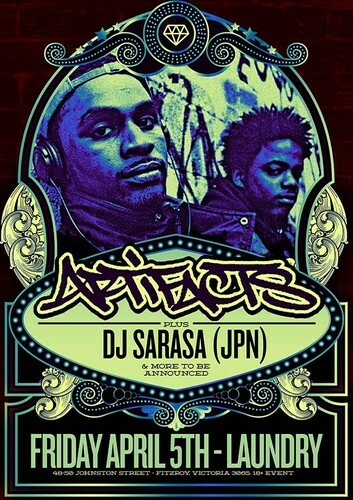 Now having reformed early in 2012, Artifacts have been on a world tour and are stopping at Laundry on Friday April 5. Joining them will be DJ SARASA a.k.a. Silverboombox. An internationally acclaimed DJ, Producer, Founder of Mynority Classics (street wear/accessories brand), an influential blogger for Wax Poetics Japan and a Japanese Representative for the Universal Zulu Nation.